Tri-Medical is a durable medical equipment (DME) provider in New Castle, Pennsylvania. 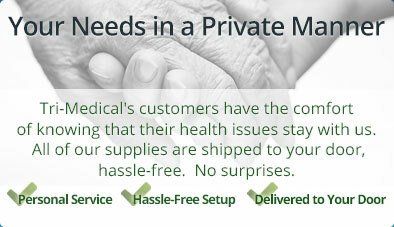 Tri-Medical : Incontinence & Medical Supply Solutions that Give You Peace of Mind. Our wide selection of incontinence and medical supplies from a variety of manufacturers provide the style and design that best fits your needs. Find out if you are eligible in 4 Easy Steps. Learn more about how Tri-Medical can support and supply your MCP or MCO organization from our large warehouse in New Castle, PA.